FILE - Activists hold a banner during a demonstration organized by HIAS, founded as the Hebrew Immigrant Aid Society, outside the U.S. Capitol in Washington, Sept. 14, 2017. HIAS, the Jewish nonprofit singled out by the Pittsburgh synagogue assailant, is one of a number of religious-affiliated groups in the United States that provide help to refugees. It's the motto of one of the oldest refugee resettlement agencies in the United States, the Hebrew Immigrant Aid Society — better known by its acronym HIAS. 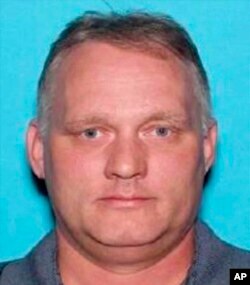 That work of aiding the displaced and newly arrived for more than a century is what drew the ire of Robert Bowers, who is accused of opening fire in a Pittsburgh, Pennsylvania, synagogue on Saturday, killing 11 people. Authorities say Bowers screamed "All Jews must die" as he fired. He made his first appearance in court Monday morning and faces 29 charges. "There are no words to express how devastated we are by the events in Pittsburgh this morning," HIAS staff said in a statement issued hours after the shooting. "This loss is our loss." The only known link between the synagogue and the refugee agency was their connection to Judaism. Tree of Life was a house of worship and not the HIAS affiliate in Pittsburgh. 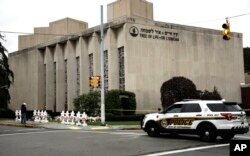 But by all accounts, the shooter was allegedly focused on targeting the Jewish community. Screenshots of comments Bowers made on the social networking website Gab hours before the shooting showed that HIAS was a target for his anti-Semitic rage: "hiaslikes (sic) to bring invaders in that kill our people. I can't sit by and watch my people get slaughtered," Bowers wrote. "Screw your optics, I'm going in." Gab was taken down in the wake of the rampage. In another post two-and-a-half weeks earlier, he accused HIAS of "bring(ing) in hostile invaders to dwell among us." And in another, he referred to "filthy evil jews Bringing the Filthy evil Muslims into the Country!!" Bowers is charged with murder, attempted murder and hate crimes, making the shooting a federal investigation. A police vehicle is seen near the Tree of Life/Or L'Simcha Synagogue in Pittsburgh, Pennsylvania, Oct. 29, 2018. HIAS began in the 1800s as an aid organization focused on Jewish communities, but expanded into one of nine main contractors for the U.S. refugee program in the 20th century. It is a Jewish organization in the same way that several other refugee agencies are religiously affiliated — they began with a religious framework of charity and aid, and expanded their network to help refugees of all nationalities and religions. Monday morning, a New York radio station spoke with Melanie Nezer, HIAS senior vice president of communications. "We used to help refugees because they were Jewish," she said. "Now, we help refugees because we are Jewish." A New York Times profile of the agency over the weekend included the personal story of a Muslim Iraqi refugee aided by HIAS. In print and on social media, several prominent refugees in the U.S. showed their support for the organization that helped their families. Among them was singer Regina Spektor and Masha Gessen, a writer and two-time exilee, who quickly penned a piece in The New Yorker magazine. Lev Golinkin seized the moment to write about his experience fleeing the USSR. "HIAS was what remained when the rest of your life had disintegrated, when there was no money, no way to communicate, no going back," he said. "HIAS was what kept you tethered to the world when you became a ghost but weren't yet ready to die."